The Surface Inspection Market was valued at USD 2.02 Billion in 2015 and is expected to grow at a CAGR of 7.9% between 2016 and 2022. The market growth can be directly linked with the growth of the manufacturing industry. Increasing demand for quality from manufacturers and customers has made vision-based surface inspection the key technology in the area of manufacturing and quality control. Recent advancements in the inspection technology such as advanced cameras, software, and image sensors have increased the scope for these systems to be used in a wide range of applications in various industrial sectors. Industries have realized the importance of quality assurance in manufacturing, which has resulted in the widespread acceptance of surface inspection as an integral part of the long-term quality improvement process. ISRA VISION AG (Germany) is a global provider of surface inspection and image processing systems. The company operates through two segments: surface vision and industrial automation. Its surface vision segment provides surface inspection solution for panels, sheets, painted finishes, and patterned finishes. The company provides quality products and services to its customers and is involved in the field of machine vision and surface inspection. ISRA VISION acquired Vision Experts GmbH (Germany) in 2015 to enhance its customer base and product offerings in print products inspection. The company intends to grow through technological developments; it has initiated technologies such as the Fast Tuning technology for surface master inspection systems. AMETEK, Inc. (U.S.) is a global manufacturer and provider of electronic instruments and electromechanical devices. The company’s subsidiary, AMETEK Surface Vision, was formed in 2015 through the acquisition of the Surface Inspection Systems Division from Cognex Corporation (U.S.). AMETEK Surface Vision designs, develops, manufactures, and markets machine vision solutions used to inspect the surfaces of materials processed in a continuous fashion. The company has a broad product portfolio of vision solutions optimized for web and surface inspection and monitoring and process surveillance applications. The company focuses on implementing its core growth strategies, which include global market expansion, operational excellence, investments in new product development, and strategic acquisitions. The company has also boosted its efforts to expand in the attractive, higher-growth market segments and geographic regions worldwide. It has invested in emerging economies such as India and Southeast Asia to grow its R&D, sales, and service capabilities. This would help the company in expanding its R&D, sales, and service capabilities. 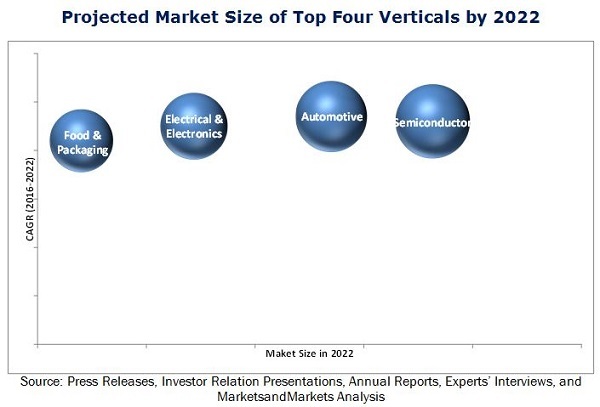 Other major players in surface inspection market include Omron Corporation (Japan), Teledyne Technologies Inc. (U.S.), Microscan Systems, Inc. (U.S.), Toshiba Corporation (Japan), Panasonic Corporation (Japan), Matrox Electronic Systems Ltd. (Canada), IMS Messsysteme GmbH (Germany), and VITRONIC GmbH (Germany). This report provides a detailed insight of the overall surface inspection market, with detailed segmentations based on component, surface type, system, vertical, and geography, combined with the qualitative analysis of the market. The said market has been forecasted till 2022.